FRANKFURT, Germany (AP) — Wladimir Klitschko's manager says Tyson Fury will undergo a doping test before the two fighters meet in their heavyweight rematch next month. Bernd Boente says doping tests for both fighters are written into the contract for the Oct. 29 fight in Manchester and will be conducted by the Voluntary Anti-Doping Association, based in Las Vegas. 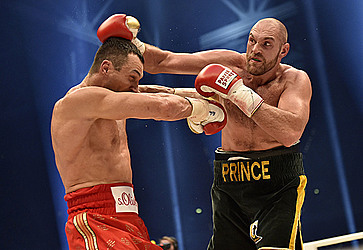 Fury beat Klitschko in November to claim the WBA, WBO and IBF titles. A rematch was originally scheduled for July 9 but was postponed after Fury said he sustained an ankle injury. It was disclosed in August, on the same day Fury announced the injury, that the new champion had been charged by the U.K. Anti-Doping agency and suspended from the sport after testing positive for a banned substance. Fury and his cousin Hughie, a heavyweight boxer who was also suspended, had their bans lifted "pending full determination of the charges," UKAD said in August.